So most of you know that I put a lot of effort into my family. My husband and I work really hard at our jobs, both ones that take place inside and outside of our home. And after a week of being mom and dad to our beautiful tribe and so-and-so to work, we relish in time to ourselves. I even tell our kids that mom and dad need to go kiss and go to dinner and get dressed up. And the cute kiddos love to help us pick just the right shoes and lipstick for the night. Yes, it is as quaint as it seems. We have lived in Houston long enough that things are getting boring. Have you tried to go on a date in a boring town? Well, the town isn't boring---but we have eaten in a lot of the restaurants and seen most of the sights. Even then, we still make it a priority to make time for each other. So when husband said he booked a hotel for a night away, I said yes in .0001 seconds (though I was not expecting much since "we have done everything". The hotel he booked was really lovely and 20 minutes from our house. We checked in and then headed to Top Golf. I just will eat burgers for every meal so I had to try one there. Let me just say the burger was fine but I was really surprised at how much fun I had just being together and knowing we still had a whole night and day ahead of us! After establishing that I am terrible at golf but great at eating burgers, we headed to WalMart to buy whatever we wanted. The trick was it had to be stuff we normally don't buy,so,, junk food! wahoo! In a world where non-organic non-free-trade processed food is shunned, I felt vitalized buy buying my favorite treats. We did something similar years ago and it brought back so many memories. This was the Friday before Christmas and it was so nice to read a good book and eat myself into a sugar comma with my best friend. It has been such a rotten year last few months for us and the night away was truly inspired. I loved that he knew what I needed even though I was a little grumpy about it. In a world that relies so much on media and technology (I mean, you wouldn't even be reading this if not for technology so please know we love Technology), it was a welcome reprieve to turn everything off and just be together like it was when we first were dating. I know, the ancient days of limited cell-phone use and pay-per-text, gasp! ""FOREVER MY GIRL is about second chances and finding our way back home. This wonderful film is perfect for all of us who believe in courtship, romance, and love enduring all things. 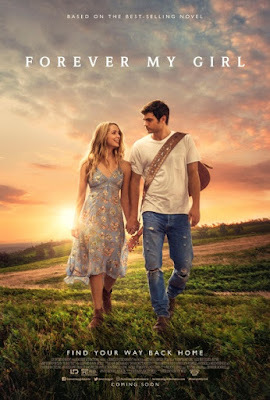 It also has an amazing music soundtrack that includes hot CMA New Artist of the Year nominee Lauren Alaina, Travis Tritt, and Alex Roe who stars in our film as country star “Liam Page.”"
We all need to take time to focus on things that matter. And when you want something to last, you take it seriously and treat it as such. I take my job as a Stay-at-home-mom and wife seriously. Both "jobs" I made a choice to take, and it is something that really matters. I love how this film shows that there are consequences but there is also room for love and forgiveness. In a marriage that lasts, there has to be plenty of room for both. Mark your calendar and get a sitter and head to the movies to see this film on January 19th. It is a new year and that means it is a perfect chance to make changes and start new beginnings.